While the west coast and Colorado appear to be basking in the glow of the Green Rush, the rest of America is watching apprehensively as cannabis legalization moves from crawling to walking along the east coast a midwest. While some of us may be getting restless with the limited number of direct marijuana jobs in our state and neighborhood, online marijuana jobs are beginning to assert themselves at the forefront of the industry. Before delving into the specifics of the legal marijuana industry, take a wider look at the American job market as a whole; in doing so, you’ll find that online careers are responsible for providing many individuals with part and full-time work, regardless of where in the country they are located. 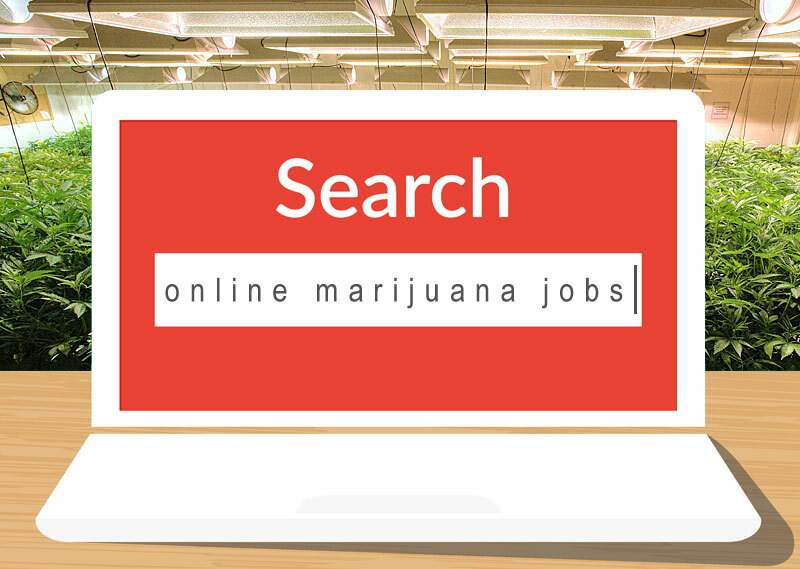 The Cannabiz: What Online Marijuana Jobs are Out There? Especially with the advent of streamlined file sharing websites, people with online marijuana jobs living somewhere in the midwest can be just as involved as an Oregonian. While not every marijuana position can be carried out online, there are several valid and potentially lucrative paths to follow for those with the desire to move the industry forward. Even on the web, longstanding stigma attached to the cannabusiness has culled many innovators from starting their own professional ventures. Now, as the way is being paved by major apps and websites, there is greater opportunity for web developers to have their work taken seriously by non-cannabis industries. Conversely, the flood of interest toward web development in cannabis is increasing competition between parties and promoting better services, but greater difficulty in making financial returns. Two great examples of online marijuana jobs that have had a major effect on the legal marijuana industry are Leafly and Weedmaps. Both of these sites have been referred to as “Yelp-like service(s)…” given that they aggregate cannabis dispensary listings from around the country and in your neighborhood. Leafly in particular has bolstered a strong internet presence based not only on their business listings, but from their informative content and marijuana strain information as well. Weedmaps on the other hand, is more suited to the app world, capitalizing on making it as easy as possible for medical and recreational customers to legally seek out and purchase cannabis products. As far as online marijuana jobs go, web development in theory doesn’t require degrees or certifications, but it always helps to have some credibility in getting off the ground floor. One of the beauties of the internet has been the business opportunities it’s provided for those without significant means; arguably, it’s getting much harder to become a distinct presence in the development world without money and connections. Becoming a developer for the cannabis industry can definitely be a worthwhile pursuit–it’s just important that developers understand how quickly the market is expanding. What better online marijuana job can you imagine than reviewing cannabis products! Originally billed as “strain reviewer,” cannabis critics consume, then synthesize an opinion on a wide variety of cannabis flower strains, concentrates, edibles, topicals and tinctures, as well as products like vaporizers, bongs and other paraphernalia. Cannabis criticism jobs are one of those online marijuana jobs that doesn’t require much more than a working computer and the ability to word process–and obtain cannabis, of course. Professionally compensated cannabis critic jobs are admittedly few and far between, but more positions are opening up as both niche and general publications seek to add cannabis critics to their list of contributors. The first major strain reviewer job arose from The Denver Post in time with the recreational legalization measures that were first taking hold. Since Colorado was the first state to legalize adult marijuana use, it’s no surprise that publishers at the Denver Post jumped on the opportunity to increase their viewership with cannabis critics. Today, the Denver Post’s ancillary publication, The Cannabist, is an established, credible entity where you can find diverse content from reviews to in-depth articles on cannabis law. As the establishment of cannabis criticism aligns with the growth of online marijuana jobs, writers and cannabis lovers are scouring for paid gigs reviewing products. While magazines like High Times, Dope and more have incorporated criticism into their layout, this position still has a ways to go in being accepted as a legitimate career. Luckily, with the increase in well-researched and written material coming from online marijuana jobs, the future looks bright for this creative cannabis career. While not all graphic design is carried out on the computer, the nature of the design world at current allows for designers to work remotely, using online resources to send work and receive feedback. Part of the overall re-branding process of the cannabiz is to detach the stigma associated with the marijuana business and marijuana itself. The explosion of marijuana graphic design jobs put graphic designers in the right place to foot the bill for a business’ desire to highlight the professionalism in the legal cannabis industry, as well as create infographics and motion graphics to give a mainstream look and appeal to cannabis products, rather than treating it solely as an avenue to get high. Designers have been instrumental in creating content that is educational and can be consumed with ease. Graphic design is a great avenue to follow when pursuing work in a creative field that actually affords for artists to make livable wages. Although strain criticism may be attractive for writers solely interested in sharing their opinions on cannabis, there are diverse opportunities in writing content as demanded by cannabusinesses of all varieties. Piggybacking on the online marijuana jobs of graphic designers are content writers who provide the research, information and structured material needed to sell a product, convey a message or represent a brand. Content writing is an ideal online marijuana job, considering the relatively few resources writers need to start working. Building your portfolio as a cannabis content writer requires workers to be open to writing for magazines, stores, marketing firms and anything else that involves the cannabiz. In order to help businesses separate themselves above the competition, content writers are using Search Engine Optimization (SEO) tactics such as keywording and internal/external linking to give businesses more clout in the eyes of search engines like Google. Content writing is one of the more “stable” online marijuana jobs insofar as writers will always be needed so long as professional content writing and marketing helps to enhance a company’s chances of turning a greater profit. Additionally, this is one of the best cannabis gigs for introverts, as it requires very little interaction with clients and employers. That’s right! Though the American education systems hasn’t quite opened its doors to accrediting cannabis education, there are certification courses and job training programs that can be carried out completely online. Cannabis professionals are industry experts who lead students through certification via pre-recorded videos, live discussions and online exchange. Being a cannabis professor requires someone who has already had success in the business, or who has established their credibility and then some. It is the job of the professor to create curricula and exams for students to best teach them the specifics of working in the marijuana industry, so they have a greater chance of job placement. A standard on how cannabis certifications should be awarded has not yet been established, so each job training program will likely be different. It is the job of the online cannabis professor to create a formula for student success. While there are plenty of intriguing online marijuana jobs, many of the jobs the business is classically associated simply can’t be carried out solely online. Cannabis cultivation and processing jobs (ie. trimming, extraction) can only be carried out in facilities like farms and labs by way of hands-on contact with the plant. Even legal cannabis distribution cannot be performed online. Marijuana legalization is carried out by states on an individual basis, meaning that interstate commerce is strictly forbidden. This means that if you’ve always dreamed of working as a budtender, you’ll either have to move somewhere dispensaries can legally operate, or wait for your current region to adopt legal sales. Ultimately, the downside to online marijuana jobs comes down to the lack of exposure to cannabis workers get. While there are certainly ways to easily obtain illegal cannabis products, most individuals are looking for jobs they can work openly, without having to worry about being fined or arrested for growing and selling cannabis. With each passing year, it seems that the lives of many Americans are drawn further into the online universe. Coming with us of course are our jobs. More and more, workers are able to use online resources to build careers for themselves that give them the freedom of location. While there are certainly many advantages to the connectivity of the online world, being on the internet for extended periods can be very draining in its own light. It’s important with online marijuana jobs to balance computer time with physical movement and stretching, so that you can create habits for your work that allows for a prolonged career working online marijuana jobs.